One of the world’s most exclusive tourism destinations, Mauritius has resisted the global financial crisis and established itself as a leading African economy. Secure, open and a pioneer of public-private partnerships in the region, Mauritius has inspired trust around the world through its strong regulatory frameworks, sound competition and continuous investment in infrastructure. Thanks to its forward-thinking, market-focused government and investment bodies, the island is positively brimming with opportunities in a range of sectors that include agro-industry, fi nancial services, real estate, commercial marinas, seafood and aquaculture, manufacturing, ICT and business process outsourcing (BPO), as well as renewable energy. Business Outlook, a London-based communications company, had the pleasure of hosting a roundtable forum there in the spring. Attended by keynote speakers that include government offi cials and prolifi c members of the business community, the Business Outlook Leadership Series fora are interactive, open-forum discussions led by experts in their field. The fora are designed to stimulate dialogue on the key issues affecting economic growth and long-term development today. 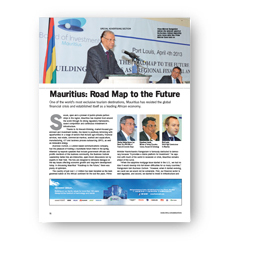 In discussing Mauritius’ “Roadmap to the Future,” there was plenty of optimism. The country of just over 1.2 million has been heralded as the bestgoverned nation on the African continent for the last fi ve years. Prime Minister Navinchandra Ramgoolam is famously dedicated to democracy because “it provides a stable platform for investment.” he says. And with much of the world in recession or crisis, Mauritius remains ahead of the curve. “When the subprime mortgage issue started in the U.S., we had no idea it would develop into full-blown diffi culties for so many countries,” Ramgoolam told Business Outlook. “However, when it started evolving, we could see we would not be vulnerable. First, our fi nancial sector is well regulated, and second, we started to invest in infrastructure and accelerated the reforms we began implementing in 2005. We brought corporate and personal taxes down to 15%. We then opened up to foreign talent and expertise, so that investors could work and buy property here. We abolished exchange controls a long time ago and there are now no taxes or dividends to pay and no inheritance tax, which is attracting a lot of people. Subscribe to our email newsletter to receive our news, updates and reports.